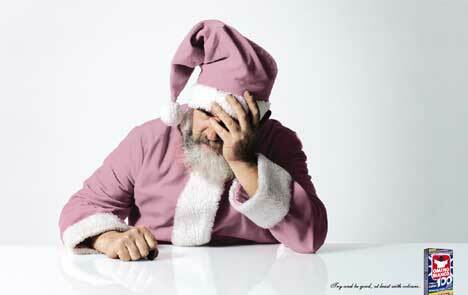 Italian laundry products from Omino Bianco are recommended for Santa’s suit this year. “Try and be good, at least with colours.” Babbo Natale in Italy (Father Christmas) would normally be seen in bright red, not a dull purple. The Omino Bianco Santa ad was developed at Publicis Italy by creative director Alasdhair Macgregor Hastie, art director Stefano Colombo and copywriter Marina Ruiz, photographer Matteo Cremonini.